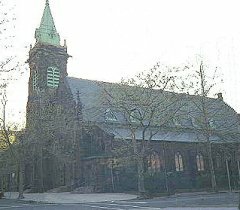 St. Aloysius' Roman Catholic Church was founded in 1879 with no land, church or house. The only thing that they had was an old frame building called St. Thomas' School. The cornerstone of the church was laid on June 20, 1880 and the dedication was on May 8, 1881. The rectory was built in 1882 and the convent in 1884. A new schoolhouse was built in November, 1886, having the same name, St. Thomas, as the original school (founded 1874). NOTE: Microfilm originals are at the church. Records are in Latin unless otherwise noted. Includes individual indexes for all items except the first baptismal register, the minutes and the confirmations.